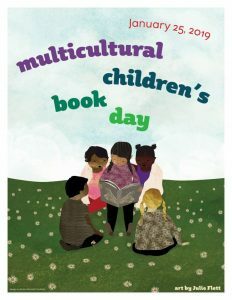 Today is Multicultural Children’s Book Day and we’re SO excited!! We’ve got one book from our friends at Lee and Low Books that we’re talking about today, and two more we’ll mention below that are also must-reads. But before you get the scoop about Little Melba and Her Big Trombone, learn about the origins of MCCBD and help us celebrate and promote diversity in kidlit. Use the hashtag #ReadYourWorld and spread the word! Despite census data that shows 37% of the US population consists of people of color, only 10% of children’s books published have diversity content. Using the Multicultural Children’s Book Day, Mia and Valarie are on a mission to change all of that. 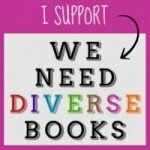 Their mission is to not only raise awareness for the kid’s books that celebrate diversity, but to get more of these types of books into classrooms and libraries. 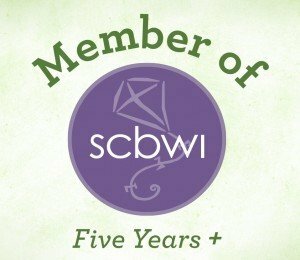 Another goal of this exciting event is to create a compilation of books and favorite reads that will provide not only a new reading list for the winter, but also a way to expose brilliant books to families, teachers, and libraries. You can find the MCCBD blog and links to all the other participating sites here. Pick an instrument, any instrument – would you pick the trombone? Well, in Little Melba and Her Big Trombone, (Lee and Low, $18.95, Ages 4-8) by Katheryn Russell-Brown with illustrations by Frank Morrison, that’s exactly what Melba Doretta Liston did and never once looked back! This eye-opening fictionalized picture book biography recounts the story of a jazz pioneer whose contribution to the music industry is presented in irresistible prose and artwork certain to get your toes tapping and fingers snapping. Born in pre-Depression Kansas City, Melba had the music in her from an early age. In fact making music would always matter to Melba. It was easy to be influenced when “avenues were lined with jazz club, street bands, and folks harmonizing on every corner.” From blues to jazz to gospel, Melba loved it all and soaked up all the sounds around her. At age seven she chose a “shiny trombone: from the traveling music store and, with the help of her grandpa and her keen ear, Melba learned how to play it. Interior artwork from Little Melba and her Big Trombone by Katheryn Russell-Brown with illustrations by Frank Morrison, Lee & Low Books, ©2014. 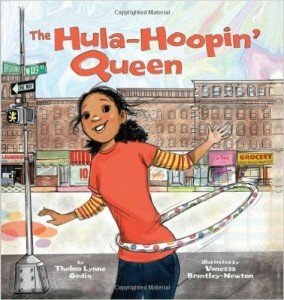 Lend a Hand and The Hula-Hoopin’ Queen. Simply get an empty toilet paper roll, scissors, wax paper, a rubber band (or masking tape), fun stickers, and something sharp like the point of the scissors (NOTE: for parents to do only!). Cut a piece of the wax paper that is large enough to completely cover the hole at one end with room to spare for fastening it down. Use a rubber band or masking tape to hold the wax paper in place. One option is to make small holes in the wax paper then have your child decorate the toilet roll with stickers or patterned duct tape and try out the sound. Another option is to make one hole in the part of the toilet paper roll that is not covered by the wax paper, and no holes in the wax paper. Have your child ompare the sounds these two types of kazoos make. Try making the instrument with a paper towel roll instead. Is the sound any different using a long paper roll? Will more holes cut into the toilet paper roll or paper towel rolls make the sounds change? MCCBD Diversity Book Lists and Resources for Educators and Parents is now available. Turn off the TV, power down the devices, and take the children to the museum … simply by opening up this visually impressive book! Colorful, intricately drawn animal life forms, will instantly grab children’s attention. A breath-taking two page spread of the “Tree of Animal Life” follows. The curators explain that this unusual tree illustrates ” … how organisms that appear to be very different have … evolved from one another over millions of years … (p. 5).” Children (and adults) will find it fascinating to follow the branches up from the stem (Invertebrates) to see the development of, and interrelationships between, animal life forms. For example, a lungfish and a cockatoo once shared the Vertebrate branch. The curators note that the further away from the stem a species is, the more the species has evolved in order to survive. As children continue turning pages, they enter individual “galleries” (or book chapters) which are ” … arranged by shared characteristics and in evolutionary order to show how the animal kingdom… (p.1) ” developed over eons of time into invertebrates, fish, amphibians, reptiles, birds, and mammals. Interior spread from Animalium by Jenny Broom and Katie Scott, ©2014 Big Picture Press. The curators encourage their young visitors to ” … look for characteristic similarities and read the text to find out more about how the animals are comparable. (p.1).” Each gallery also sports a “habitat diorama” where children can learn about the ecosystem that supports those animals and how they have adapted to life in that environment. In examining the Arctic Tundra, children will learn that many of the mammals there, such as the polar bear, are predatory carnivores, requiring the protein found in meat to help fuel the energy these animals need to keep warm. Broom’s narrative is engaging and flows smoothly. While age appropriate, it is not simplistic nor condescending. Scientific vocabulary (cnidarian, amphibian, phylum) is used throughout the book with the meanings gracefully woven into the narrative. Two page spreads feature general information and characteristics about a group of animals. A “Key to the plate” presents information specific to the animals found in the accompanying illustration, numbered like a field guide. Scott makes excellent use of the book’s oversized format with a stunning full-paged spread of the Emperor Penguins and a diagram of the Nile Crocodile’s skeleton. Other spreads, such as the European frog, cover the bottom halves of two pages. This enables Scott to effectively and sequentially depict the frog’s five stages of development from frogspawn to adult. Her intricate pen and ink drawings, digitally colored, are reminiscent of work done by artists and naturalists like John James Audubon. Additional material in the book includes a preface by Dr. Sandra Knapp of the Natural History Museum of London, England stressing the importance of biodiversity and a “Library” of several online resources. Check out Big Picture Press to see several images from the book and Candlewick Press for information on the author and the illustrator and to order your copy. Watch the YouTube book trailer below, too. So visit a “museum” that never closes-and keep children engaged for many hours. Animalium is a highly recommended middle grade nonfiction book for home, schools, and public libraries plus there’s never an admission fee. to hand out instead of candy. In homes across America, families are preparing for Halloween. Many are looking for a candy substitute, something to offer as a treat. Is there something sugar-free that will still bring a smile to kids’ faces? Consider this great idea – comic books! Take note parents! On Saturday, October 25th, participating comic book shops will be handing out FREE comics to anyone who comes to their stores in celebration of Halloween ComicFest in addition to hosting special Halloween activities in communities across the US, Canada and internationally. There are 19 free comics available to choose from that are great for readers of all ages with titles that include, Scooby Doo and Batman Team Up, Marvel Secret Wars, My Little Pony, Afterlife with Archie, Angry Birds, Plants vs. Zombies, and more! Each pack contains 20 mini-comics and are only available to purchase at comic book shops for just $4.99 per pack. Such a delicious deal that won’t get stuck in your teeth! There are seven titles to choose from which include Angry Birds, Betty and Veronica, Plants vs. Zombies, BOOM! Studios Fright Fest, LBX Little Battlers, Mermin and Vamplets. The Mini-Comic packs are a healthy alternative to candy, promote literacy, provide entertainment for families to enjoy, can be used as prizes for Halloween games or prizes used in the classroom. Click here to find participating comic shops in your community. “Our BOOM! Studios Halloween Fright Fest mini-comic, featuring stories from Adventure Time, Peanuts, and Fraggle Rock, is sooooo sweet that you don’t need to eat any candy! Plus, you won’t get any cavities from reading it either. Because it’s comics!” – BOOM! Studios publisher. “The LBX Halloween Comic-Fest sampler is better than candy because super-strong cardboard robots that battle each other on command are pretty much better than anything, right? And this new manga series is actually about super-strong cardboard robots who battle each other on command! Kids will love LBX because it’s about kids who do tournament battles with super-strong cardboard robots that battle each other on command (which is, of course, better than candy…or most anything). It’s a kid-safe comic starring an actual kid trying to save the world with his paper robot. What’s not to love, really. Handing out the LBX mini-comic will make even the dullest, apple-giving, toothbrush house the most popular because you can win anyone over with manga, even the most super-strong cardboard robot-hating neighbor kid. Only, since there aren’t any kids who hate super-strong cardboard robots (especially if they can battle each other on command), you don’t have to worry about that. Can’t help you with the toothbrushes, though.” – Joel Enos, editor of the Little Battlers comic from VIZ Media. Good Reads With Ronna recently interviewed notable Parisian artist and author Hervé Tullet via email before his upcoming trip to Los Angeles. Tullet, the creative force behind the best-selling Press Here, and his latest, Mix It Up!, will be at both MOCA & LACMA this weekend conducting mural workshops for children using his books as inspiration. Both books are published by Chronicle Books, cost $15.99 each, and are recommended for ages 3-5. Good Reads With Ronna: At what age would you recommend parents begin introducing art to their children to look at? To engage in? GRWR: Were you stirred and moved by art as young as age three – five like the age of the kids your books are geared to? GRWR: Your new book is just so kid-friendly. Why do you think no one has thought of your brilliant idea for a book like Mix It Up! sooner? TULLET: On the one hand, hand I think that ideas are in the air and everybody can catch them. That’s what happens when you find one; it looks like it came out of the blue. On the other hand, I think that it is a long process of maturation and that I spent lot of time on, nearly obsessed, to find, to think, to search, go on thinking again, erase, cut and at last find the ideas. Press Here and Mix it Up! are the result of this long process, the high point of 20 years of exploration and work. GRWR: By having kids get down on their hands and knees with some color and a paintbrush (at your workshops), while you’re out there motivating them, what are the things you’d like to achieve? TULLET: I’m motivated by having a great time all together and making great memories. And maybe, from this experience, it will create a desire to have another one, or it will be a seed that will flourish later on, out of the blue. Or, maybe not exactly out of the blue. GRWR: What do kids say to you after they’ve worked on the enormous mural? TULLET: A look, a smile, a word, a hand shake, a kiss, a sign, a thank you. All these are so deep, so sincere, so true, to me that I accept all of them as true gifts. Don’t miss Tullet’s L.A. appearances this weekend at MOCA & LACMA on Saturday, 10/11 and Sunday, 10/12. Head to L.A. Parent to get more details by clicking here. In that article, you can also read Tullet’s reply to my question: Is there anything you’d like to say to the families of L.A. and Southern California who will be attending your events? I’m sure you’ll get a kick out of his warm and welcoming response. To purchase Press Here and Mix It Up! head to your local independent bookseller. Happy Read Across America Day 2014! We’re happy to share some wonderful opportunities with you from Oceanhouse Media on the occasion of NEA’s Read Across America Day! In honor of Dr. Seuss’s Birthday and Read Across America Day, Oceanhouse Media has created this fantastic offering that we’re certain will mean smiles around! 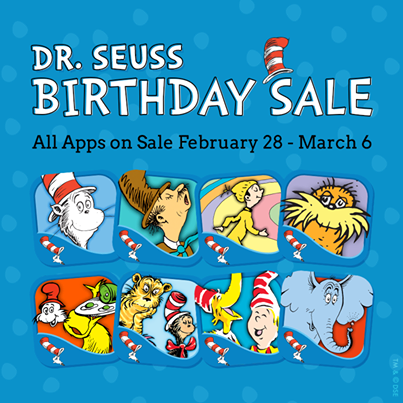 -More than 60 Dr. Seuss apps are on sale for iOS and Android through March 6th, starting at just $.99. Find all the deals here. -Find a Facebook contest & Instagram contest where Oceanhouse Media is giving away a 10-pack of Dr. Seuss apps. -On Monday, March 3rd (Read Across America Day) Oceanhouse Media will have hourly promo code giveaways on their Facebook page from 12pm-5pm PST. Ronna Mandel interviews local L.A. author Ann Whitford Paul who’s written a new book, ‘Twas the Late Night of Christmas with illustrations by Nancy Hayashi. NOTE: Consider making your purchase before the holiday season and house guests roll in. It’s an ideal present for the moms in your life who need to know there is light at the end of the hectic, sometimes dim Yuletide tunnel. With tongue-in-cheek (and all her holiday shopping already completed), Paul manages to entertain readers in need of a laugh and a nudge from one who’s been there whispering wisely, “Let it go!” Check the GRWR Facebook and Twitter pages for dates of Paul’s appearances at bookstores around town. 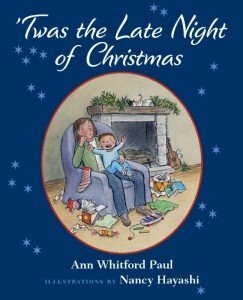 ‘Twas the Late Night of Christmas by Ann Whitford Paul with illustrations by Nancy Hayashi, 2013. Santa’s gone. The kids are complaining. Mom and dad have reached capacity. 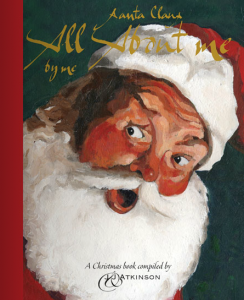 ‘Twas the Late Night of Christmas, your new gift book and a parody of Moore’s famous 19th century poem, shares the exhaustion of post-holiday-partum. The house is a wreck and who’s left to clean up? The parents. Or in this case the mom. Who or what inspired you to pen this tongue-in-cheek tale? I’ve always loved the magic of Christmas and gone all-out, filling my house with handmade decorations—Christmas quilts and throws, pillows and pictures, wall hangings and toys. Right after Christmas I begin making new decorations for the following year. As you can imagine, the number of decorations has gotten out of hand and the more I make, the more exhausted I’ve become. This book came out of a combination of my love for the holiday of giving and thinking of others and at the same time my weariness from all the work involved. I dream Mrs. Saint Nick might come and help me with the resulting chaos of the holiday. 175 Projects for kids of all ages to create, build, design, explore and share. Martha Stewart’s Favorite Crafts for Kids (Potter Craft, $24.99, trade paperback), written by the Editors of Martha Stewart Living, is reviewed by Mary Brown. We love to see our kids doing crafts. In theory, a craft project keeps the young ones busy and quiet for an extended time, and may produce something worth giving to grandma for her birthday. But coming up with fun, un-lame projects that utilize inexpensive, easily procured items can be challenging. Martha Stewart to the rescue! In Martha Stewart’s Favorite Crafts for Kids, the domestic guru has produced an impeccable collection of crafts with kids in mind. While not every one is a winner, the book has enough good ideas to be worthwhile, and the fresh, modern volume is a delight to look at. Be warned: almost all of the crafts listed in the book require adult help and supervision, for most kids under 10 or so. Some precocious, crafty or older kids might be able to figure things out on their own, but most of these projects will involve planning and hands-on monitoring. The instructions are straightforward and minimal, which is fine when showing how to make Paper Bag Puppets, but the Tin Can Toys look like they would require an engineer with a good tool chest to complete. Buy this book knowing that your presence will be required. The book is divided into categories of craft types, which also cover a variety of age ranges and interests. There is a section for making animals and characters out of various materials; designs and embellishments; and science-type experiments. 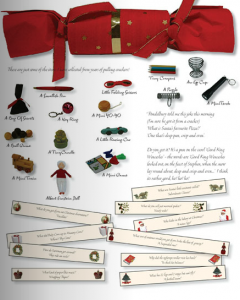 The book also delves into all kinds of little boxes and organizers, as well as gifts to make. It’s nice that there are a number of activities that would appeal to boys, particularly building projects (Peg Board Marble Run and the Toy Service Station) and physical games like Elephant Stilts. There are plenty of cute girl-oriented items, like barrettes, purses, dolls and jewelry. My favorite projects included a Scented Scrub for the bath, and the Snow Globes. I do wish though that there was an index of craft projects at the front of the book, and that some of the how-to explanations (like for sewing projects) were a bit more thorough. I would be happy to own this book just for its fun, creative aesthetic, and some of the ideas would be good jumping-off points for my own interpretations of the projects. Many of the activities look too challenging for most young children, however. You know how you sit a kid down with a project but you end up doing most of it yourself? Also, many of the crafts involve the adult making something that the kid then plays with, like the Beach Board Games or the Map Puzzle. Some of the activities require found objects from nature – bark, twigs, leaves, rocks – that may not be available in some urban areas or dry climates. There is also a precious, “Martha-Stewart-Perfect” quality to the book that may intimidate the parent who lacks craft confidence. My (oops, I mean my kids’) Pom-Pom Animals will never look like that! Out of 175 crafts, however, you’re sure to find enough project ideas to inspire creativity in you and your kids for many happy hours. Today’s reviewer, Mary Brown, is a scriptreader for Hollywood film studios, putting her bookworm childhood to professional use. Her favorite place is her sewing studio, where she designs and creates quilts, functional items and garments. You can see photos and thoughts on her work at www.arroyoquilts.com. She has managed to get two of her kids through college; her youngest is still in high school and has autism. His challenges keep her sitting up and paying attention to life. From its stunning cover image and title to the very last illustration, FArTHER ($17.99, Templar Books, all ages) by Kate Greenaway Medal winner Grahame Baker-Smith will take readers to new picture book heights. 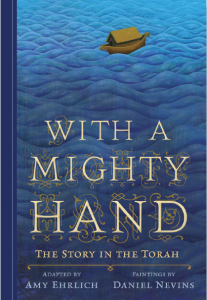 Baker-Smith has written and illustrated this deeply touching and immensely satisfying book as much for adults as for children. The art, a bit Da Vinci meets Dali and Dutch Masters, is spectacular, magical and will beckon you back again and again to study every last detail. If you’d like to learn more about how the art is created, read this wonderful article from the Telegraph in England. England also happens to be where Baker-Smith calls home. The book introduces readers to a narrator looking back on his childhood with a father consumed by a dream to fly. Visually stunning, the pictures of the inventions are at once elaborate and chaotic cluing readers into the mind of the boy’s inventor father. The father’s preoccupation with all things flight often left the young boy wanting for his father’s attention. But when he eventually got the attention it was as special as any of the dad’s creations. Sadly one day the lad’s father is called to war, never to return. The corresponding artwork – red poppies – is significant in its symbolism for those who gave their lives for their country and is worn on Remembrance Day in the U.K. It’s interesting to note that when the dad is shown tinkering with his flying machines, his work table is a mess. When the boy grows up and pursues his father’s dream of flying, his table appears organized. It’s subtle things like this that make each page a treat to explore. Now a father, the narrator has hopes and desires for his own son and wonders if the child will aspire farther than his grandfather or father. Regardless of what may happen in the future, the dreams of this family are firmly planted in each new generation making the sky the limit.